You are in for a treat with this newly renovated private ground floor/end unit condo facing the 13th hole par 3 over water. A very comfortable, immaculately maintained condo having THE BEST VIEWS on the East Course of Grenelefe Golf & Tennis Resort. Our unit has 1197 sqft (2 bedroom/2 baths) 2 flat screen tvs and another tv in the second bedroom. Free wifi and cable with a private lanai overlooking the golf course. All the desired amenities of home with none of the worries. In December 2017, we renovated our home. So it is all up to date with new stainless steel appliances, new carpeting, electrical, granite, paint and tile. THIS VACATION your job is to sit back, relax and enjoy either your Golfer's Getaway or your Theme Park adventures, or maybe you just want peace and quiet. When your day is finished, take a seat on the patio, enjoy the many colors of the sky with a great meal and a cocktail. Imagine a vacation as simple as this. GOLFERS: There are two awesome 18 hole golf courses in this peaceful, naturally wooded sprawling 1178 acre setting. The East Course is co-designed by Arnold Palmer & Ed Seay and has gently rolling fairways which challenge the golfer for precision and accuracy. South Course is a Ron Garl designed course and has fabulous wide open fairways and beautiful greens. Nine other courses are within a 15 minute drive. If you love golf, convenience, and comfortable accommodations, then this is the right place for you and your family. FAMILIES: The excitement of Orlando's many attractions are within a 30 minute drive. All the luxuries of home with the anticipation of Disney World, Universal Studios, Epcot Center, Sea World, newly renovated Cypress Gardens now Lego Land just minutes away, Busch Gardens, Lowry Park Zoo, Kennedy Space Center, the Gulf Coast are nearby. When staying at Grenelefe Resort you will enjoy all the desired amenities and activities of an Orlando vacation, but without the aggravation and congestion of other theme park accommodations. Enjoy Lake Eva Community Park with bike/run trails, aquatic center, tennis/basketball courts, playground and more just minutes away. This condo is within walking distance of the pool/hot tub, lounge/food, arcade, clubhouse (currently under renovations), tennis, pro shop, and fitness trails. Unwind or take a walk to Lake Marion and do some Bass fishing or visit other local lakes. It just can't get any better than this: Abundant Sunshine, Golf, and World Class Attractions. Our home is the right place for you and your family. Grenelefe is centrally located to both Orlando and Tampa airports. Please feel free to call or send an email if you have any questions. The serene views and golf course. Is always available for any questions. Everyone that either lives revisits grenelefe resort makes you feel like family. Always hate leaving when our stay is up. As previous condo owners at Grenelefe, we were very impressed with all of the upgrades in this unit. You will not be disappointed! It is clean and welcoming and well stocked. 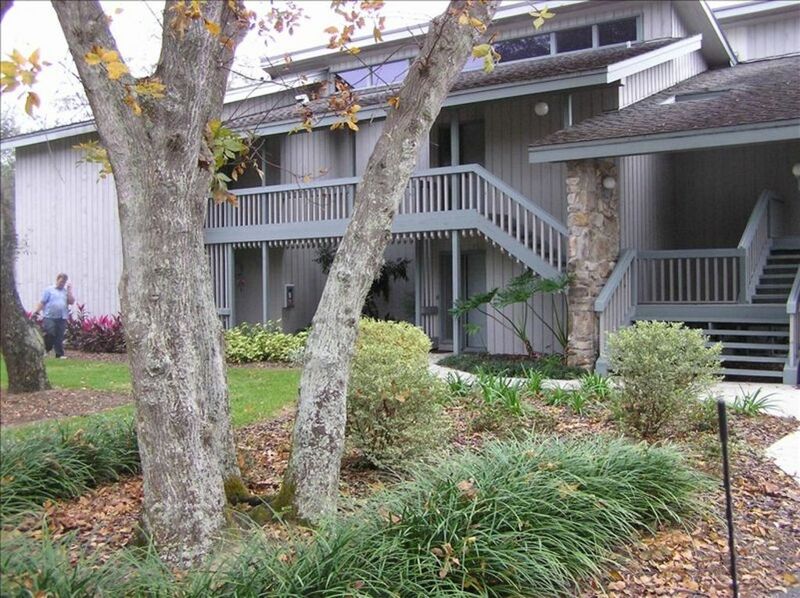 Grenelefe is a quiet golf community with easy access to Orlando or either coast. This beautiful unit has the East Course's signature water hole, #13, as its view from the lanai. There is not a better view in the community! We felt very safe while walking each morning throughout the tree lined community. The pool was warm and inviting after a round of golf. Joan is always there with answers to any questions. She is very reliable and always accommodating. We plan to return in 2019! Thanks so much for your assessment of our newly remodeled unit. I am a bit proud of the outcome. Come back again in 2019. The condo is all new and very clean. There is all the things you need and the kitchen is all furnish. The condo is on a golf course and quiet. I would recommend it to anybody who like to be away from the busy life and want to relax. This property has been renovated, it is a wonderful place to stay. So very neat, clean, and beautifully decorated. The owner was so nice and helpful. Would definitely stay there again.. Thanks so much for your review. I really appreciate you taking the time. Please come back any time. This was our eighth year in this condo and as usual we thoroughly enjoyed our stay. The owners surprised us with many beautiful renovations which made our stay even more comfortable. Highly recommend this beautiful condo located in the most scenic part of Grenelefe Golf Resort. Love that you call this your winter home. Glad you enjoyed the renovations. Thanks for booking 2019 year as well. We love having this couple come back every year, they treat our unit as if it is their own. Will be back..it was hard to leave felt like home. Deanna- we will see you next December. Thanks for being our first guest in our newly renovated condo unit.